BRISTOL, Tenn. — When it comes to the K&N Pro Series East in 2018, Todd Gilliland is batting 1.000. 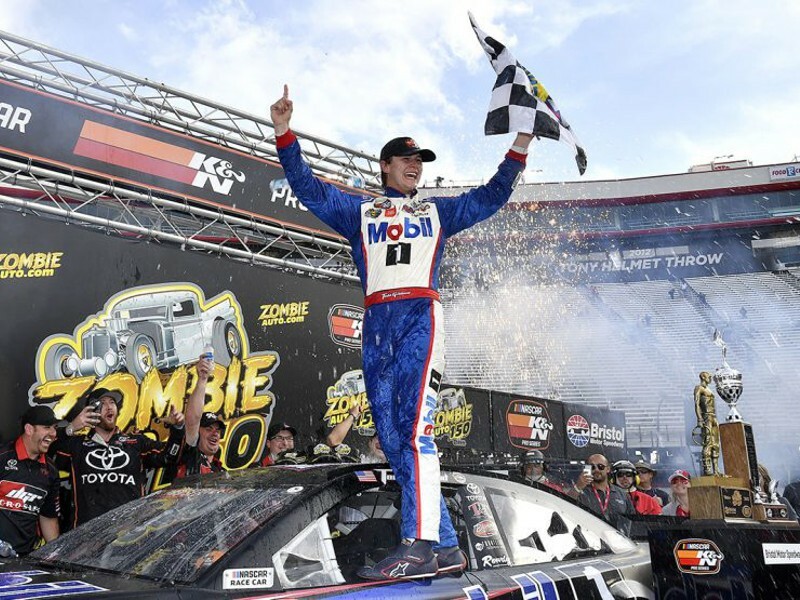 The Sherrils Ford, North Carolina, native won the Zombie Auto 150 at Bristol Motor Speedway on Saturday afternoon, holding off Harrison Burton on the final 10-lap sprint to the finish. Gilliland crossed the finish line 1.494 seconds ahead of Burton, the defending race winner. The victory is Gilliland’s second in a row in the K&N Pro East, as he took the season-opening New Smyrna 175 at New Smyrna Speedway one month ago. The win is also Gilliland’s 20th in 50 starts across both the K&N Pro East and West series. “It means so much,” said Gilliland, who is running a partial schedule in the K&N Pro Series and Camping World Truck Series after winning the last two K&N Pro West titles. “I think once you get that first one out of the way, you kind of get that winning feeling and you just know what it’s like. In two previous K&N Pro East starts at Thunder Valley, Gilliland started 21st and finished eighth in 2016 and started eighth and finished ninth last season. But on Saturday, the third time was the charm. It didn’t come easy, though, as three red flags for a combined 22 minutes and one second, coupled with 10 cautions slowed the race and continually erased the leader’s advantage. “It’s really nerve-wracking for sure,” Gilliland said. “Especially during red flags, it gets really hot and you just have a lot of time to think about it. Overall, you just have to have a really good spotter and crew chief. My dad was on the radio. It’s all about staying focused. Gilliland, Burton and third-place place finisher Noah Gragson are Camping World Truck Series teammates for Kyle Busch Motorsports. Gilliland is racing in the K&N Pro Series this year for his father’s DGR-CROSLEY team. Burton finished third in the opener at New Smyrna after battling Gilliland for the lead over the final laps. This time, however, Gilliland was able to get away on the final restart. Tyler Ankrum finished in fourth, with Brandon McReynolds in fifth. Tyler Dippel, Dawsonville, Georgia’s Spencer Davis, Ronnie Bassett, Jr., Eddie MacDonald and Ruben Garcia Jr. completed the top 10. The K&N Pro Series East returns to the track in two weeks at Virginia’s Langley Speedway for the Visit Hampton VA 150. Todd Gilliland won his 20th NASCAR K&N Pro Series event and second East race in a row on Saturday at Bristol Motor Speedway.